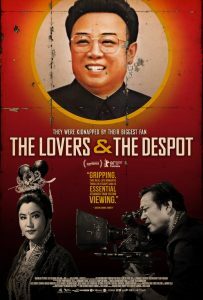 THE LOVERS AND THE DESPOT offers a compelling look at one of the more bizarrely stranger-than-fiction episodes in cinematic history telling the story of young, ambitious South Korean filmmaker Shin Sang-ok and actress Choi Eun-hee, who met and fell in love in 1950s post-war Korea. In the 70s, after reaching the top of Korean society following a string of successful films, Choi was kidnapped in Hong Kong by North Korean agents and taken to meet Kim Jong-il. While searching for Choi, Shin also was kidnapped, and following five years of imprisonment, the couple was reunited by the movie-obsessed Kim, who declared them his personal filmmakers. Choi and Shin planned a daring, life-threatening escape, but not before being forced to produce 17 feature films for the dictator and gaining his trust in the process.